Right before hitting publish on Bill McKibben’s invitation to take part in an ambitious global satellite art project, this incredible graffiti art video arrived from Barcelona…Before reading on, we suggest giving it a watch! We need help from artists–we need them to help with an artwork bigger than humans have ever built before, the first global-scale group show. It's going to be slightly wild, and very beautiful. Sometimes the work of artists is to remind us of things we've forgotten, things we know in our bones but that slip our minds. In this case, it's the fact that we live on a planet. Yes, in a house. Yes, in a town in a country. But most of all on a planet–something that's a little too big for most of us to think about every day. But not, as it turns out, too big for us to destroy. The pictures rolling in this summer from Pakistan, Russia, and Greenland make it abundantly clear that we're drowning, burning, and melting this earth–all because we're pouring vast quantities of carbon into the atmosphere. As best we can tell right now, global warming is how human civilization runs itself on to the rocks–but it's not too late (maybe) to change that outcome. But we haven't won yet. The power of the great fossil fuel companies is unbroken. They make more money than any industry in human history, and so far that's been enough to delay real action. So we need to reach past people's heads to their hearts, and that's where art comes in. Environmentalists have traditionally been more comfortable with the side of the brain that likes bar graphs; we need to engage the rest of our souls in the service of this movement. 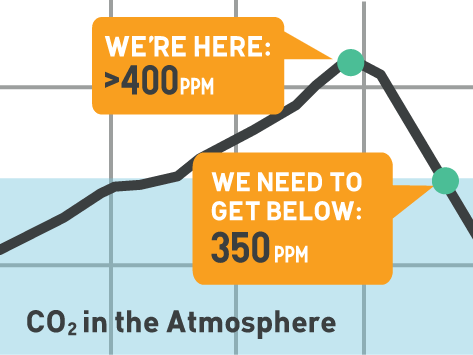 So, on November 27 (the opening weekend of the UN Climate Meetings in Cancun, Mexico), in 20 places around the world, we'll be gathering huge numbers of people–thousands at a time. Some will be in deserts, some on snowfields, some wading out into warm lagoons–anyplace with a good background. They will use their bodies to make giant images. And our good friends at Digital Globe Satellite will take their pictures from outer space. Masses of human bodies are a relatively new medium with which to make art. But we've done a little bit of it before, enough to know how powerful it can be. 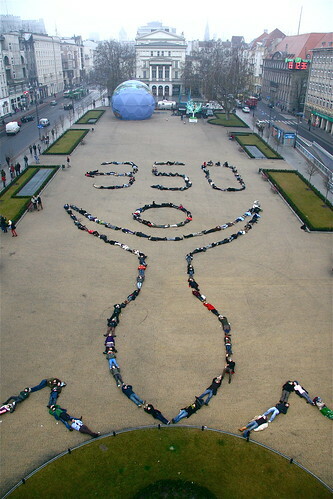 Here's a small piece our friend John Quigley (Spectral Q) arranged one year at climate demonstrations in Poland. 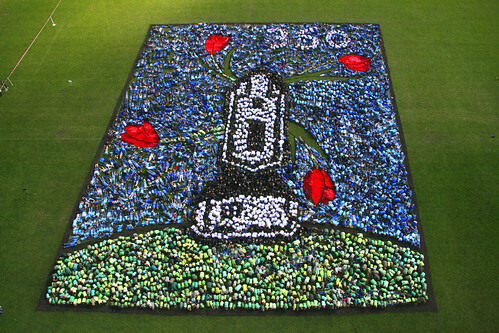 And here's a more complicated piece that our friend Daniel Dancer did in the Netherlands with 5,000 schoolkids. You'll notice that all these images have a 350 in them–we need to get that number across. But we need artists to come up with the images that will help galvanize attention, help explain the crisis we face, the beauty that's at risk. They need to be simple enough that you can make them with humans and easy materials. Which means that, at some level, artistic vision needs to be bent a little to the practicalities and politics at hand. For instance, Alexis Rockman is a knockout painter–here's one of his giant canvases. And Mark Dion his powerful work has been shown at MOMA and the Tate. Both of them have generously provided us sketches that we can transform into giant human works of art. They need, obviously, to be simple–simple enough to execute, simple enough to connect. And we don't need just world-famous artists: we need local artists deeply connected with their place and their neighbors, who can imagine images that will also make sense to the whole planet. Here's a set of more technical guidelines to spur your imagination: www.350.org/earth Most of us who do this work, me included, are volunteers. So although we can't compensate artists monetarily, we may be able to provide the materials they need to realize their climate design as well as provide fantastic international media exposure for their climate artwork. And of course, we're extremely eager to hear from people who want to, literally, put their bodies on the line to help create these art pieces that will be captured from satellites orbiting high above the earth. A movement takes many things, from people willing to call their Congressmen to people willing to go to jail. But it also–maybe most of all–requires people who can help us see the new world we're trying to build. Some of those people we call artists, and right now we need your help as never before. We have no guarantee we'll win the battle for the future–right now we're losing. But we're sure as hell going to put up a beauty of a fight. Cross-posted from Grist.org & Treehugger.